DKMS World Blood Cancer Day is a global awareness day dedicated to the fight against blood cancer. 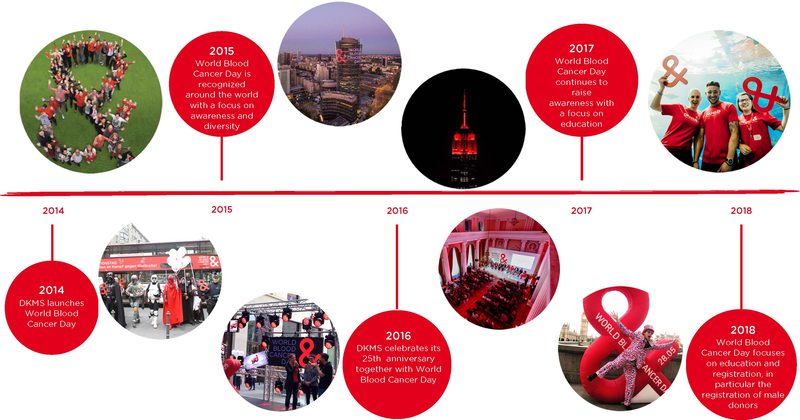 Our story begins in 2014, when DKMS created the day in order to raise awareness of blood cancer and show support with those affected – all over the world. Our aim is to join together individuals, friends, families, communities, companies, organizations and anyone ready to support. Since blood cancer unfortunately knows no boundaries, we too need to join together and show solidarity. DKMS World Blood Cancer Day is held every year on May 28 – the birthday of DKMS. The universal call to action is Make your mark and the official symbol is & – which symbolizes solidarity with those affected by blood cancer. The symbol connects patients with donors, families, friends and supporters, demonstrating commitment, community and solidarity. In the past, we have seen communities around the world show their support – from Berlin, to New York, Warsaw, London and Barcelona. Supporters can make their mark in many ways – the goal is to spread the message far and wide. Over the past four years, DKMS has expanded World Blood Cancer Day from the launch in Germany to a global awareness day. Highlights include lighting the Empire State Building in red in New York, celebrity support from Georgia May Jagger in London, a 25th anniversary event for DKMS in Berlin, a press conference on the social cost of blood cancer in Warsaw, and many, many donor-patient meetings and donor recruitment events around the world. 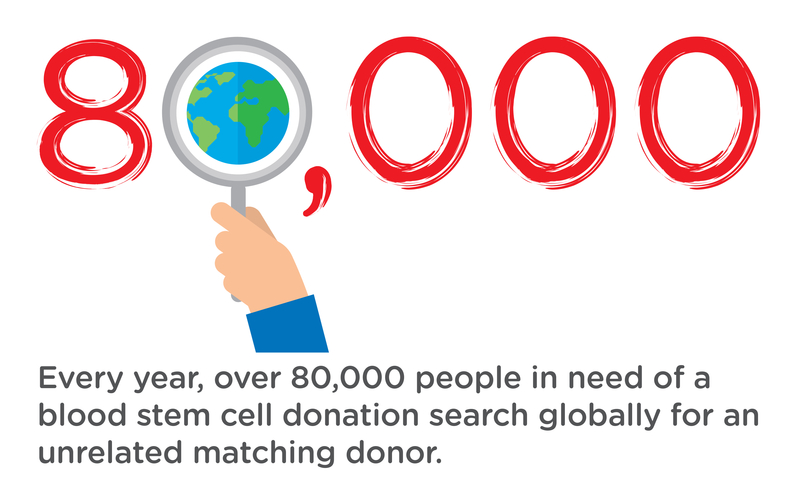 Every year, over 80,000 people in need of a blood stem cell donation search globally for an unrelated matching donor. DKMS works internationally and created a global awareness day because anyone can be diagnosed with blood cancer – and anyone in good health and between the age of 18 and 55 can be found as a matching stem cell donor. 74% of all stem cell donations enabled by DKMS are sent abroad, showing the global need for stem cell donors. Together with your help, we can work towards our aim of giving everyone in need of a stem cell donation a second chance at life. Every 35 seconds, someone somewhere in the world is diagnosed with blood cancer. This video uses a medical approach to describe the changes in the body when blood cancer is diagnosed and explain what is meant by the term ‘blood cancer’. Since there are many different types of blood cancer, the term ‘blood cancer’ is a general description for various diseases of the blood-forming system. Watch our video and find out more. Blood cancer refers to defects in the blood-forming system. These defects stop the normal process of maturation and natural cell death, leading to the formation of immature or dysfunctional blood cells. These blood cells, which can no longer carry out normal cell functions and no longer die a natural death, are known as cancer cells. They enter the bloodstream and multiply uncontrollably, crowding out the healthy cells. This means the blood can no longer perform its tasks, such as oxygen transportation and defense against germs. 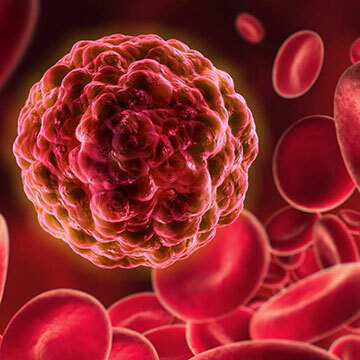 Depending on the level of maturity of the blood cells in which these malignant changes take places, doctors distinguish between three main groups of blood cancer: leukemia, multiple myeloma and malignant lymphoma (cancer of the lymph nodes). For many people diagnosed with blood cancer, a blood stem cell donation from a matching donor is their only chance of survival. The transplant of healthy stem cells helps the recipient’s bone marrow regenerate and start producing healthy blood cells again. However, in order for the transplant to have the greatest chance of success, the tissue characteristics of the donor should match the tissue characteristics of the recipient almost exactly. Since there are several thousand different combinations of tissue characteristics, which are influenced by ethnicity and can be very rare, finding a matching donor can be challenging – a bit like finding a needle in a haystack. This is why DKMS raises awareness and works internationally to not only register as many potential stem cell donors as possible, but also to increase the diversity of our worldwide pool of registered donors. Our goal is to provide everyone in need of a stem cell donation with a second chance at life. What is World Blood Cancer Day?